We made these lady bug cookies a few weeks ago. They are definitely far from being perfect, but it was more important for us to have fun in the kitchen that day! 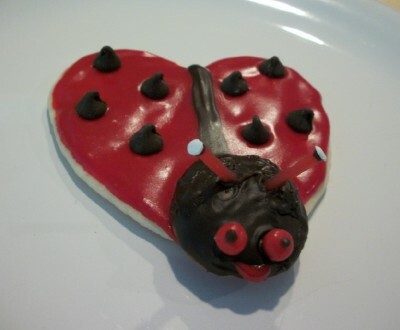 This will at least give you the idea of a cute and easy lady bug cookie! We used sugar cookies, mini vanilla wafers, Twizzler strips, chocolate chips, cookie frosting, white and red candies. Make your favorite sugar cookie recipe. Cut them out with a heart shaped cookie cutter. Bake and cool. We frosted our sugar cookie hearts red for the body and frosted the vanilla wafer heads in chocolate. We added our red candy for the eyes. We sniped off a couple of red twizzlers for the antennas. We put white candies on those with our frosting. We added our chocolate chips for the spots on the body. We put a line down the middle of the back to make wings. 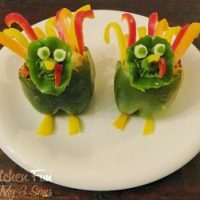 The kids had a lot of fun with these! « Previous PostThe Mexican Batman! Next Post » Morning Monkey Pancakes for Breakfast! 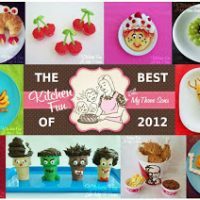 Our 25 Best Fun Food Creations of 2012! So cute! On valentine's day i made "love bug" cookies usng a heart shaped cutter like you. Thanks! These are nothing even compared to your cookies. Yours are fantastic! We also made Spider Man cookie hearts for Valentines day. They turned out awesome! Was going to wait until next Valentines day to post them. The biki ones are so cute!! 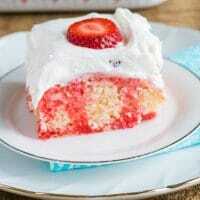 These look cute! Nice concept.